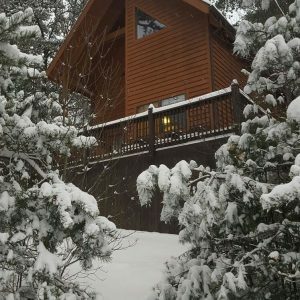 Our family stayed at the Blue Ridge Parkway cabin at the beginning of February. Jill gave us detailed directions on how to get to the cabin; things to see and do; and places to eat prior to arriving. The information she provided allowed us to plan our stay prior to leaving. The cabin was extremely cozy and clean. While there, my family and I enjoyed visiting the Linville Caverns and snow tubing at Jones Ridge Snow Tubing. The cabin is close to many trails. We hiked one of the shorter trails and saw a beautiful waterfall. The views there were gorgeous. We look forward to planning another stay during the Fall. ← Coming back this Fall!